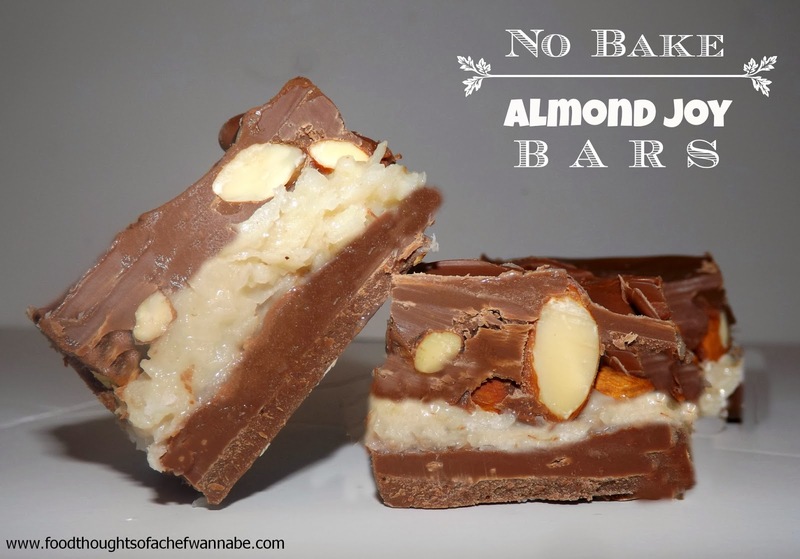 I love that phrase "no bake". Do you? Although in the dead of summer I love it more, but it always makes me feel invincible when I tackle something no bake. It is like fool proof, a child could make it. I am always thinking to myself, "YES, girl you GOT this". No bake, baking. Genius. I am STILL using up what I overbought for Christmas. Seriously, ridiculous. I am not a coconut fan, but my husband is and since he just had surgery I am out to make him smile. We all know if we feed the tummy, we feed the soul right? Almond Joy is the candy bar someone who hated me would buy me. It is the opposite for my husband. Now almonds, definitely, chocolate, absolutely, coconut, bleh. People either love it or hate it don't they? Not many fence riders on the subject of coconut. I KNEW he was going to love these. And he did. Since it is so easy, let's get with it. Here is what you will need, not many ingredients at all! Line an 8x8 or 9x9 square dish with half of your chocolate chips in the microwave. 30 seconds at a time and stir until melted. Spread into the bottom evenly. Set aside while you combine the condensed milk, and coconut in a bowl. Make sure they are completely mixed. Spread this mixture on top of the chocolate. Sprinkle your almonds on top (or you can add them to your top chocolate layer. Set in the fridge for 20 minutes. Now, melt the remaining chocolate and spread it on top. Refrigerate for at least 3 hours. Longer or overnight is even better. See how easy? I told you!